In Origin 2018 and 2018b, we support cell formula in User-Defined Parameter rows and Data area of worksheet. 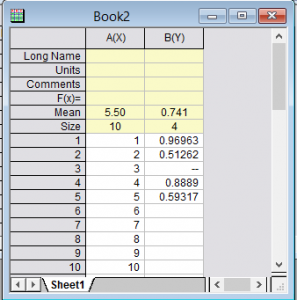 You can easily type =Mean(C) to calculate mean of column C or =Mean(This) to calculate mean of current Column. In Versions before Origin 2018, you can calculate each column’s mean and size in worksheet and put them in column label rows by a few lines of LabTalk Script. wks.userparam1 = 1; //show this row named "Mean"
As you can see from the code above, you can use the user-defined parameter row’s name as cell row index to access it directly. 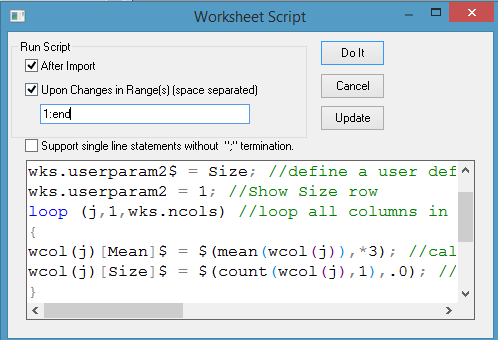 Choose Worksheet: Worksheet Script… menu. Copy the Script above into the big box in the dialog. Check After Script and Upon Changes in Ranges(s) (space separated) checkboxes. Enter 1:end as the range so changes in any column will trigger the script. Click Do It or Update button. Choose File: Save Template As… and give a meaningful template name, e.g. Mean_Size_in_Label. Choose File: Recent Book: or use Open Template button to load it and enter some data to see the update in Mean and Size rows.